Theresa May makes Merkel look frumpy, she is frumpishness personified, there is a photo of her in the dictionary under “frumpy”. She does make Ardern look good though with one small caveat when attending a formal welcome with a military parade button up your damn jacket. I am a stylist to the middle aged kiwi bloke, more than just a hobby but not enough to make a career out of it. Seriously my wife dresses me. I had some years in the British Army and a guard of honour takes a lot of work to put together and is one of the more formal occasions for a soldier so while our girl looked great for a casual wander down a boulevardblatt with a friend she could have been more buttoned up..literally and figuratively. Its a look which like immigration policy is something she shares with Trump. To be fair to Jacinda maybe her jacket wouldn’t button up over her bump…. On the other hand, at least her outfit was better than the one she wore to meet Macron. I think she got the outfits the wrong way around tbh, after all Macron is French and his wife is a bit of a style icon, that she looked frumpy there was a bad look for NZ, but in that outfit she wore yesterday she wouldn’t have looked as frumpy today in Germany. 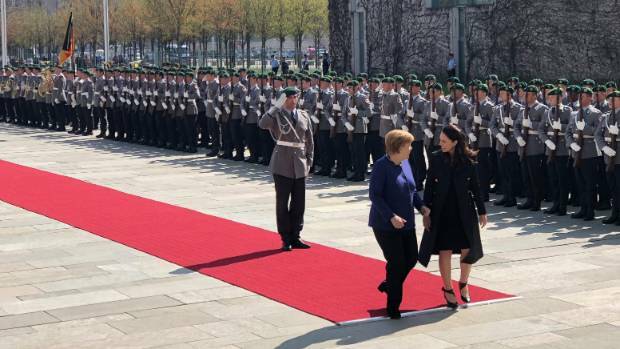 Yep, I was thinking that Merkel made Jacinda look less frumpy, but also that dress and jacket appear to work better for her, though I haven’t seen a close up look to be certain. I don’t ordinarily like criticise the way politicians dress but must admit the Crown Prince of Saudi Arabia did make President Trump look frumpy. Not hard I would have thought, to be honest FLOTUS makes Trump look Frumpy. its a shame but there arnt many tinpot dictators left adorned in fabulous uniforms with sashes and a million medals. For me the world is a less interesting place. Keep an eye on Shane Jones. At the rate he’s currently awarding himself intersting & novel new titles he could be very impressively adorned by the end of this government’s term if it lasts the full distance. If Ron Mark doesn’t beat him to it by adding a few extra medals…. It would suit his pomposity and verbosity and I could see him quite comfortable delivering a Castro type 6 hour speech. On the flip side doling out a billion bucks of the regions hard earned taxes back to the regions for photo opportunities and votes while destroying their economies could see him in a Saddam type pickle. That’s harsh, I would have thought she looks more like she shops at Farmers or Ezibuy, Maybe Glassons. Of course 3 years plus out of NZ I am not sure what they are like these days for Fashion, and she may just as easily shop at David Jones (I understand they are now in the old Kirk’s building). love to see you and travs wardrobes and have them …critiqued by a fashionista…typical ,green eyed women.My guess is you look like Dawn French and probably,dress like her. Not green eyes Blazer, rather blue. But gee it’s nice (or creepy) that you have thought about what I might look like. Blazer, that comment – if meant the way it reads – is disgusting, and sexist. It is not the first time you have directed sexist and (occasional) borderline misogynistic remarks to known female posters. It is comments like that which make boards like this a hostile and unfriendly environment for women, it is no wonder there are few women who post here if they come on and read some of the stuff you post. these sensitive women who post have no qualms about lambasting the appearance and dress sense of NZ’s 37 y.o P.M….talk about hypocrisy. Discussing what the PM is wearing vs you making disgusting comments about milking shed and breeding barn, with the clear sexist overtones, are two different things. But are you really a chick ? On KB they have a Harriet who is a guy. Its the net we have no way of really knowing what you are . Who cares what she wears ? She aint a guy who can buy one suit and use it every day anywhere and get away with it. Bringing up her dress to attack her I find sexist and inane . NZ has a proud tradition of landgirls working on farms and in the Thoroughbred breeding industry.Nothing disgusting about..it. Angela is a politician not a fashion model.. I think she is about 20 years older than Jacinda.. Some European leaders just refuse to see what is happening right in front of them, they chastise their voters and citizens for being ticked off with the awful job they are doing and label them dolts, racist, nationalists and basically old and out of touch with the modern thinking. They have ceded sovereignty to the EU which is not popular but has allowed them to abdicate responsibility and they have opened borders which has been a disaster. Macron rather than being exasperated by the way folk are voting but actually listen to them, Austria, Italy, Hungary, Poland, Holland, France, Germany have all had massive lurches to anti immigrant anti EU parties who dont want to suffer what is called the “Swedish Problem”. Out of touch aloof leaders (see Obama) lead to all sorts of consequences. Exactly, the EU can’t see that they are fuelling the rise in nationalism, and see the antidote as being more integration and clamping down on those they don’t like. Very few in the EU understand this, and therefore they will never understand why Brexit happened. Bizzare isnt it, usually politicians act in self interest but there seems to be a segment of them in the EU just cant bring themselves to address the issue, perhaps they are too worried about the reaction from the equally elitist journalists, opinion writers, twitter and their dinner party friends. Its like a Stockholm syndrome. I think they are too far removed in general from what the population thinks, and are convinced by the Brussels bureaucrats that they are on the side of good, that they are just blind to the realities. And to be fair I understand that the Europeans have never ‘got’ the British so they would just see Brexit as a peculiar British thing. David, you should watch this speech by a German MEP given to the EU Parliament. This guy understands Brexit better than most in the EU, he may be against it, but in subsequent interviews in the UK he has said he respects the British people’s right to vote to leave. Is it just me, or does it look like the PM has removed her shoes for this get together? That is correct. I expect she has charmed them all with that. Despite being at the Embassy it seems a little unprofessional to me. I never walk around the office without my shoes on. when did you become a role model…for crying out…loud! It doesn’t appear to be an office. Looks like it might a staff room or kitchen or something. Could it be that Jacinda, being pregnant, removed her shoes because her swelling ankles were feeling restricted by them? Who are we to criticise, especially over a detail so…inconsequential? Highly likely. If I were present, I would find this very nice that she could be so down to earth in probalbly much needed down time meeting embassy staff. Maybe Jacinda is our first tikanga Prime Minister? I think he is right overall but wrong on detail. Wall St banksters have been compared to giant Vampire Squids with their blood funnel sucking the life out of…victims…quite..apt. Fascinating guy, I watched the whole of his Channel 4 interview which was brilliant. Two podcasts he has done one with Joe Rogan and one with Dave Rubin are excellent, very entertaining and insightful. I think he long ago has made his best points, is suffering from overexposure, has developed a tendency to create ridiculous straw men in setup interviews just to make some point putting down a target group & has now become a bit tedious. I wasn’t actually thinking of the Lobster Brain I’m so over that one. I’ve seen a few other interviews where Peterson sounds after making numerous nonsense assertions that this is what feminists mean or whatever, just so he can then expound on their fundamental wrongness. The more of him you watch the more you realise he tells silly stories just to demolish them with long, tortured harangues that add up to the common sense most people employ anyway. Be fascinated to read your single cell amoeba wotsit. – and if it isn’t true it simply behoves me to make it so, as Peterson has done with Lobster Brain! Have to feel a little sorry for Ardern – Didn’t really want to be leader/PM, surrounded by incapable idiots within her own party, fighting fires for idiots within NZL First and the Greens, all whilst pregnant. Hopefully all the stories going around regarding someone she should be able to trust are untrue – time will tell though as at least one story appears to be right on the nose. Got a link or just gossiping? Have an Auckland based mate who crosses paths socially occasionally who has similar stories. Malicious gossip, whispered innuendo; tools of the PDB’s trade. I saw her on the news saying that she wasn’t planning to be leader of the party. I can’t remember when, but it was last year, I think.It was not that long before she became it, anyway. When scientist Dr Bob Brockie protested recently that the Treaty has no place in scientific endeavour he was quickly mocked by an academic commentator in the Press in Christchurch and opposed in two official postings on the Royal Society website. The organisation that formerly promoted science now has a humanities slant. It criticises scientists for the common-sense claim that science is entitled to intellectual autonomy unfettered by culture and religion. First climate science was swallowed up by political activists and now they have designs on the rest. lets play prove the climate science is political. Here are a few in denial with easily proven political links. Richard lizden Cato Institute Distinguished Senior Fellow right wing think tank. Will Happer George C. Marshall Institute right wing think tank. All these people are openly political right wing and are central players in the denial of mainstream climate science.I could go on and list many more right wing lobbyists who deny climate science. In fact you would be hard pressed to find a single person who is a denier’s of main stream climate science who does not have strong links to Conservative American think tanks or the oil gas and coal industry. Your turn prove your statement. Mainstream climate science is political and give us some evidence. You’ve proved my point beautifully, Griff. If climate science hadn’t been politicised no-one would care what personal affiliations scientists might have, let alone compile lists of their enemies with talking points about them. In other words you cant produce any evidence that main stream climate science is political . It is the denial of Climate science like yours that is political. The real science its self is just our understanding of the world . I just did and I won’t descend to your level of personal attacks on your perceived enemies. Denial of climate science is political. The mainstream science is not. After examining this question for almost a decade I know that those that deny the science never change their views. Because it becomes a faith for them. A belief without evidence to support it . He appears to be raising some good points but I haven’t seen the counter argument or exactly what partnering with Maori means and thus why he feels science is being compromised. Mātauranga Māori can be defined as ‘the knowledge, comprehension, or understanding of everything visible and invisible existing in the universe’, and is often used synonymously with wisdom. Filed in the “I don’t speak the lingo” file. Is Maori science the same as non-Maori science? Or possibly, is Maori science science? Yes, that’s the question: is “Maori science”, science? It depends on the definition of science you are talking about. The first sentence is a pretty good definition. Not sure some of the “social sciences” qualify by it. Science is superior to native traditional knowledge. And no, I am not sorry. Let’s investigate this phrase ‘scientifically’ shall we? “Common-sense”? Whose common-sense are we talking about? “Unfettered by culture and religion”? Is intellectual autonomy possible at all, much less “unfettered by culture and religion”? Science grew from culture and religion? Notably Islam and Western Christianity. Gee will you look at that, there are people who actually think everything can’t be divided up and atomized like scientists do … Can’t be seen in isolation … I guess that’s why we have Medical Ethics? My Nokia smartphone notified me of a 2nd system update to – security patch and various other improvements. So I gritted my teeth and instructed it to install them, becos security patch. So .. after it installed & rebooted the cellcam wouldn’t work. Said it didn’t have required permissions & to check my permissions. Did that. All looked ok to me. Rebooted. Still needed permissions. Forget how I got there in the end but eventually swearing at it produced a question did I want to authorise my camera to access my location. Well, no, I didn’t, but the correct answer for the camera to work was YES. Why does Google/Android insist on my camera knowing my location before it will operate? I am online still trying to get my new phone set up and discovering that its battery has a life of less than an hour and the phone number doesn’t exist, says Vodafone. Correction, I am online to print the receipt because I have misplaced the paper one and then I can take the &%$#*&^ thing back. It seems that it is, a very basic one. As all I would use it for is ringing the taxi and occasionally sending a text, I would have been quite happy with a clone of my little Nokia, now obsolete. But Vodafone’s website is not well designed and sends the would-be user around in maddening circles – rather like Microsoft ! Have you looked at Trademe here & do you still have your sim card? No to TM, yes to sim. It’s one of the most annoying websites I know ! Nokia’s prices have riz quite a bit !!! Quite funny … even to an SJW! The phrase “subjectively legitimate” absolutely does not belong in your brief monotribe … thingey … whatever it is … I don’t know what to call it? Care to elaborate on that? How so? Their needless deaths were “a fruitful encounter with modernity” maybe? Or perhaps you believe they were killed for their own good?